WELCOME TO THE FOURTH VIRTUAL VEGAN POTLUCK! I’ve got some appreciation to take care of: First of all, thank you to every one who signed on to this craziness. The directions are complicated, the reminder emails get annoying, and most of all, I know the amount of effort it takes to get a blog post to the Publish stage. I truly appreciate your time and energy. I’m always awed and inspired by what you create in the kitchen. I made a few changes in implementation for this Potluck and it’s made all of the difference. Having Mentors helping me communicate and coordinate with participants took a big weight off of my shoulders, so thank you thank you to my international crew: Rachael of Rubber Cowgirl, Keely of Gormandize, Barb of That Was Vegan?, Kamila of Sensual Appeal, Liezl of Spinach Revolution, and Angela of Canned Time. Angela wore multiple hats and did a great job with the VVP Pinterest board. And thanks to Lidia over at Vegan Bloggers Unite! for once again playing hostess to the Potluck. In a large pot, sauté the onions, carrot, and celery in some vegetable broth and/or water. Add a splash of Liquid Aminos, cover and cook the vegetables until soft. After about 10 minutes, stir in the garlic, thyme, coriander, dried onion, and black pepper. Stir for about a minute. Pour in the tomatoes, zucchini, lentils, broth, water, veggie bouillon, and artichoke hearts. Bring mixture to a boil, then turn down the heat to a simmer; cover, and cook for about 30 minutes. Stir occasionally. Stir in the sausage, spinach, and couscous and cook for about 20 more minutes. Serve piping hot with vegan Parmesan-style cheese. ONWARD! There is a LOT more eating to do! To go back to Juicy Dishes, click here or on the image below. To move forward to Soulicious Life, click here or on the image below. To start at the very beginning, click here. I’d love a bowl of that Stoup though….going through the VVP is making my stomach crazy!! I slept quite well last night. Good thing, too – cuz it’s gonna be a long day – of deliciousness ;-)! This is the Volvo of soups. Reliable, nice to drive, but not very attractive. Oh, but yummy, of course. Thanks again for organizing the VVP! I debated about using stoup, I really did. Rachael Ray makes my hackles go up. But in the end I just had to go with stoup’s descriptive powers ;-). Do your best, Lorna – but pace yourself for desserts!! I’m afraid I went straight there after yours….I just couldn’t wait! Cannot blame you one bit! Hearty is the perfect word! Thanks for organizing another amazing VVP! I am so happy to have been along for the ride. This soup looks so warm and comforting. Despite a few bumps here and there, it’s looking like the smoothest Potluck yet! Thanks so much for being a part of it (again)! That’s looks really yummy! Most of my soups turns out to be stoups, but I like them that way 🙂 Thanks for all your hard work organizing the VVP again! I’m glad I could participate! VVP = uh.ma.zing. Loving going through everyone’s posts today. You rock, Annie! Seriously blushing over here 🙂 – thank you, Claire. It still boggles my mind that ANYONE wants to do this with me. So grateful. Love your inspirational words Annie, and as always thank you for all your hard work making this a reality. Thanks also to the mentors! As for the stoup – that’s the first time I’ve heard that word and I love it!! 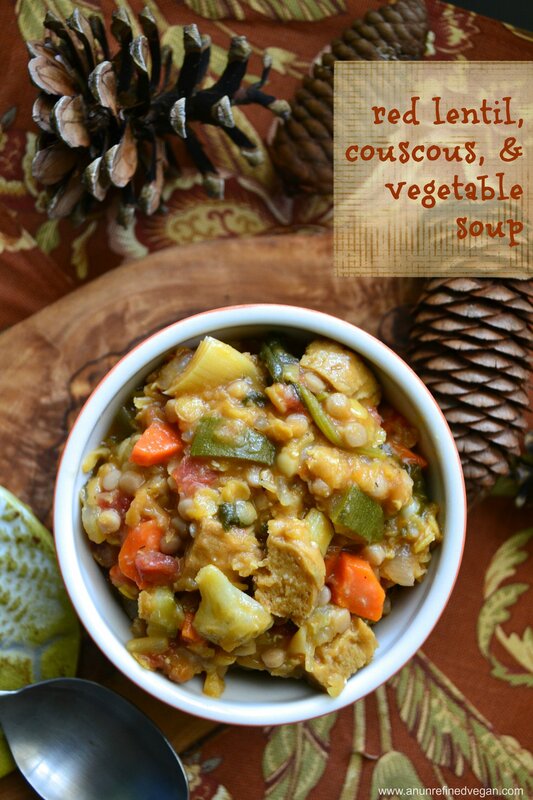 This stoup looks fabulous and hearty, just what I’m craving in the chilly weather! Thanks, Poppy. Your support means the world and thank you so much for jumping in to help clean up those little messy spots in the Potluck! My pleasure Annie! It’s been a fun potluck!! Thanks so much for organizing this fun event, Annie! Your stoup looks really good. Thank you, dear! My pleasure! Wouldn’t work without all of you lovely bloggers :-)! Oh sure it would! Great idea. I’m totally in my “comfs” right now, hehe. Enjoying a cup of tea and browsing through the Potluck! Your soup looks great, Annie! Many thanks for all of your hard work on this round of the potluck! Stoup? *giggles* I want to keep repeating that word. Stoup stoup stoup. 😛 YUM! Your stoup looks absolutely, amazingly delicious, Annie. Sooo freaking hearty! I totally want to make some stoup now!!! Thank you sooooo very much for thinking of this wonderful event! 🙂 So happy to be a part of VVP again. Hehe – yes – something addictive about STOUP! Sometimes the Auto Correct does not know best!! Thanks for playing along, Susmitha! Me, too – love lentils! This looks incredible (I know somewhere you said it didn’t… but, I’m here to say… ya-huh). And, it is the perfect time of year… as it get colder, my soups are getting thicker and thicker, anyway…. thanks for this! Thanks, Nikki :-)! Humble, but delicious. Works for me! Ahhhhh…that’s a relief!! Thank you! Loving your hearty “stoup”. Just perfect for right now. Thanks, babe! Fun, isn’t it :-)? Your stoup looks delicious, Annie! And thank you for putting together such a great event! My pleasure, Alina! Next one is in May ;-)! I am so bleary eyed that I didn’t even realize that you stooped to Stoup, and I love your stoup. thick and hearty just the way I like it. Thank you to you and all the peeps responsible for this shindig. Ohh this sounds and looks just amazing… so comforting too! Looks great! Do you think you could use quinoa instead of couscous for a gluten free option? Why yes, dear reader, I think that would work splendidly! Hehe. Glad this will work. Great job Annie! XO. Now this is my kind of soup! Nice and hearty, full of texture and my favorite flavors! Give me a blanket, a cup of tea, and a GIANT bowl of this stoup!! OHH my goodness, hearty AND delicious! That looks incredible! So delicious and easy to make… Thanks for all of your hard work ~ it’s been so much fun reading through all of these today at the same time as our friends all around the world! Total comfort in a bowl Annie, and all my favorite things! So perfect. Ah yes, stoup. Nothing says nourishing and hearty than a stoup! Thanks for putting the potluck together Anne! Sorry if I had a small delay with my entry but all is good now. Thanks again and congrats to the evergrowing event! I didn’t even notice the delay, girl 🙂 I probably slept through it! What a lovely photo of a lovely soup. I am a sucker for soup this time of year and yours includes some of my favorite ingredients! Thanks, Betsy! I could eat soup every day, I think. Great recipe, it looks so good, I even want it in the bowl displayed in the photos. So beautiful and yummy looking. I love that bowl and have had it for ages…I was so glad to be able to use it in the photo! Thank you for all the hard work that you do to get the VVP to happen. So amazing! Thank you! It went SO well this time!! Thank YOU! Great work on VVP!! You should be really proud and happy for how everything has come together. That’s a terrific looking soup. I love a real hearty, meal-like soup. I don’t watch Rachel Ray, and so the only things I knew she said were “yummo” and “EVOO” (instead of actually saying extra virgin olive oil). Stoup is a new one on me! The EVOO and yummo (don’t forget “delish!”) got real, real old. She’s the reason we got rid of the TV ;-)! Annie dear, I truly cannot thank you enough for beginning this event. I am so proud of you and feel honoured to be participating for the 4th time! You are the sweetest – – thank you so much for this – truly makes me very happy. Oh my word, Annie! I just want to curl up with a blanket and that bowl of stoup and forget about the world. Thank you again for holding such a fun event. VVP forever! Thanks for taking the time to plan and organize again Annie! Oh my, that soup looks all kinds of hearty, comforting deliciousness. Now that is a meal in a bowl! ahh a bowl of delicious stoup! Thank you Anie for all the hard work and an amazing VVP!! hehe, I don’t know Rachel Ray OR stoup but I do know that this looks like such a comforting bowl of goodness! Be thankful you haven’t been sullied by Rachel Ray and her infernal annoying abbreviations :-). Awesome event Annie! Once again a success, actually an event that has grown far too big for me to make through in a weekend! And that is awesome. I was pretty bleary-eyed by the time I went through all of the blogs on Saturday. I’ll be going back through, taking my time – – to choose the best dishes when voting opens (soon!). Thanks, Trish! Yeah, I’m changin’ it to stewp, darn it ;-)! This looks so amazing! I’ve already saved it to make it when I’m home! Thank you for organizing everything – this is an amazing community and it is so fun to be a part of it! I feel so lucky to have found such awesome people! Thanks, Laura! This has to be the heartiest Stoup ever! I eat soup every other day in the winter. This is going on my list of soups to try. I’m with you on daily soup! Perfect comfort food for cold days. Great thing about this soup (and any soup, really) is how adaptable it is to what you have on hand. Thanks for commenting! Looks like a warm hug on a cool winter night! Exactly! A warm hug that fills your belly! Were can I find a “no-salt vegetable bouillon cube”? brand please. Hi Frances – I get mine at Whole Foods. There are several brands, but the one I have currently in my cupboard is Rapunzel Vegan Vegetable Bouillon No Salt Added. YUMMY!!! This looks so hearty and filling! Soup/stew is the best thing ever when it starts to get cold outside! This looks so yummy! Perfect for the winter months. I love the thickness of stoups & can’t wait to make this. I crave soups (and stoups!) this time of year! This looks incredible Annie, I love red lentils. Happy VVP! I have a definite thing for lentil soup no matter what the season. This looks so delicious and hearty – a perfect end of the work week meal! I know you love your lentils ;-)! Gorgeous! You’re a legend for organising this massive event, glad I could help out and I’ll look forward to helping you out again for the next one. I’m thinking next potluck should feature some type of citrus – lemons, limes or oranges. I think it should be oranges. Great for savoury and sweet! Can’t wait ’til next time! Keely, I’m putting you in charge of figuring out posting times worldwide ;-)!! Thank YOU – – it was great having a team to help. And I think orange is a great idea!